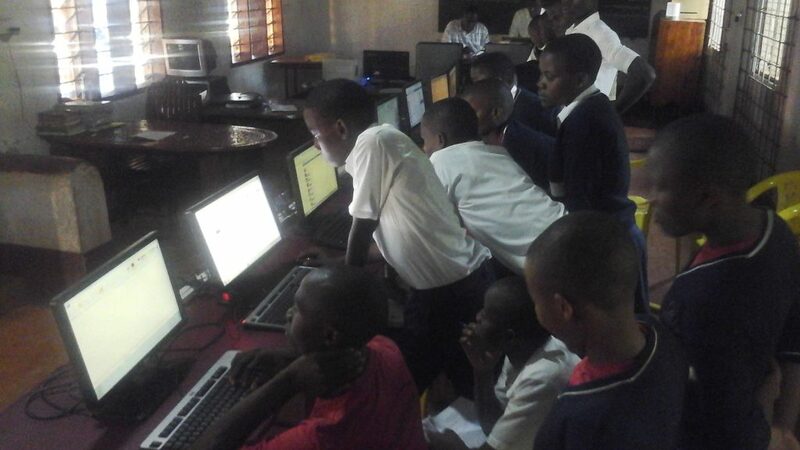 Here we see students practicing computer-literacy skills at St Florence Senior Secondary School, Bugembe, Uganda. It was in this room that I4H truly met our vision and purpose. In 2011, I4H was asked by Mr William Ashe (of LifeWater International, California) to provide a demonstration “compressed internet-browsing/e-mail system” to a school in Uganda. The project was to demonstrate “computer pen pals” between students at St Florence and same-age students in California (taught by Mr Ashe’s daughter). A young man named Robert Tabula was the computer-teacher at St Florence. He took the opportunity given to him, and ran with it. The project was so successful that Mr Ashe funded 3 more systems; this time for Farmer Co-operatives in the Bugembe area. Tabula offered to support all 4 systems on a totally volunteer basis. I had the privilege to experience some Tabula teaching/training of new student computer-users. He loves, even lives, teaching. The students catch his infectious enthusiasm. It is a joy to behold. The head teacher at St. Florence has written of the profound impact that the computer system has had on the students. Please follow this link to read his summary.